My hubby has always like pesto sauce with his pasta. However, I hate the ‘green’ smell of some of these pesto sauces which we either buy in bottles or eat at restaurants. The sight of a green mushy sauce is already a turn off for me. So, I never really pay attention to making my own pesto sauce. 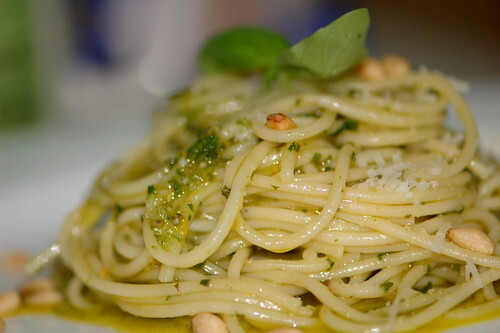 Recently, my son told me it is really easy to make pesto sauce and he has made it before. So, that sort of intrigue me and I went out to buy the two basic ingredients, i.e. 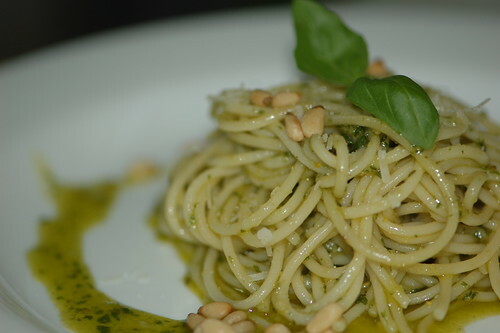 pine nuts and sweet basil. Pine nuts look exactly like sunflower seeds but they are very expensive. The nuts like the name suggests originate from pine trees. To make the pesto sauce what I did was to put a handful of pine nuts, a handful of sweet basil leaves (remove the hardy stem), a few cloves of garlic, a bit of salt and blend it with my grinder (the apparatus use for grinding nuts that come with our cheap blender, no expensive food processor for me at home). Add enough olive oil to make the pesto sauce runny. Actually we added a lot of olive oil. You can even pound these ingredients in our pestle and mortar if you like. To serve, I boiled some spaghetti and voila! Pesto sauce that tastes way better than most restaurants. I added some grated parmesan cheese to the sauce to give it a better taste but it is an option. I have leftover pesto sauce which I use as a dip for french loaves. It tastes good to dunk the bread in the greenish sauce. 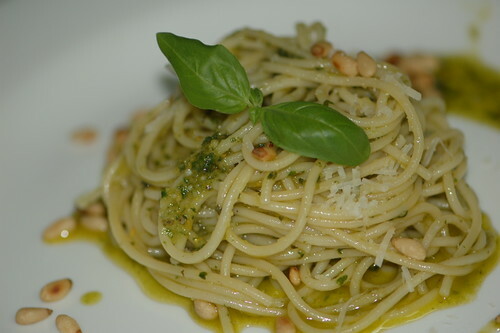 For the pine nuts and sweet basil ratio, I a bit more nuts than basil but again, it is up to the individual’s taste. Adjust as you blend the sauce. lilian… mana beli the pine nuts? i also dont like the ‘green’ smell of store bought pesto. lingzie -Don’t try with pine nuts. I got it from baking stores but Cold Storage also sells. You know what….after I ate, for several days I had a bitter taste at the back of my mouth (near the throat) everytime I eat, especially if sweet things. So, I Google why I have bitter taste and found that it was caused by pine nuts. According to some of the sites, a batch from China can cause it. I don’t think we can find other imports cos pine nuts are rather expensive. Someone teach me to use walnuts instead and if you like, add anchovies (those expensive Italian type, in can). Roast the walnuts first.